Visitors to the Memorial Art Gallery (MAG) at the University of Rochester will have the chance to explore impressionist Claude Monet’s creative process and vision, thanks to the painstaking work of faculty from Buffalo State’s Patricia H. and Richard E. Garman Art Conservation Department. In May 2016, James Hamm, professor emeritus of painting conservation; Aaron Shugar, Andrew W. Mellon professor of conservation science; Jiuan Jiuan Chen, associate professor of conservation imaging, examination and documentation, Rebecca Ploeger, assistant professor of conservation science; and then graduate student Katherine Harada spent almost a week closely examining the pigments and surface textures within Monet’s Waterloo Bridge, Veiled Sun. They then spent subsequent weeks doing an analysis of their findings. While Chen employed ultraviolet light to analyze the varnishes and restoration work, Shugar and Ploeger studied the different pigments through various spectroscopy techniques. Hamm spearheaded the endeavor. MAG visitors to Monet’s Waterloo Bridge: Vision and Process exhibition, which opens October 7 and runs through January 6, 2019, will be able to explore Monet’s creative process through state-of-the-art interactive technology. A documentary video created for specifically for the exhibition features the art conservation faculty at work. “It was a fun project that provided a unique way for the department to be involved with a major exhibition,” Chen said. The exhibit features one Waterloo Bridge painting from MAG’s collection, along with seven others borrowed from North American sister institutions. 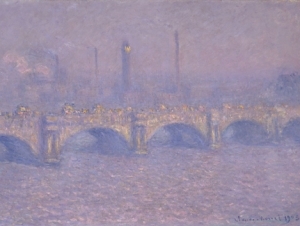 The exhibition offers visitors the unique opportunity to concurrently experience several versions of London’s Waterloo Bridge that Monet painted between 1899 and 1904. The version that the art conservation faculty worked on struck a balance, Hamm explained—polished but not overdone. Hamm, who had worked with MAG curator Nancy Norwood in the past, proposed having art conservation faculty help them understand the paintings better to make the exhibit richer. “Their only requirement was that we not directly sample anything and use all non-invasive techniques,” he said. For one week in 2016, MAG’s Monet, valued at approximately $50 million, was in the possession of the Art Conservation Department. Hamm, with input from his colleagues, wrote an article on recent imaging analysis for a scholarly catalog on Monet’s London series that was recently published by RIT Press. 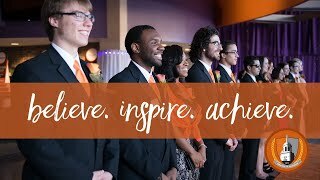 The overall collaboration for the exhibition is nothing new for the Buffalo State faculty.